We've been out of the office and will return with a new post on Friday. See you soon! New Institute of Medicine (IOM) report released shows autism is not linked to the MMR vaccine. The IOM is an independent, nonprofit organization that works outside of the government to provide unbiased and evidence-based information about health and healthcare topics. Their goal is to provide the information necessary for people to make informed decisions about their health. The IOM reviews studies applying a rigorous research process involving leading scientists and extensive peer review. In other words, they know what they’re talking about and provide sound evidence-based advice. A new report published by the IOM reviewed adverse effects from 8 common childhood vaccines: chickenpox (varicella zoster), influenza or flu (except 2009 H1N1), hepatitis B, human papillomavirus (HPV), Measles-Mumps-Rubella (MMR), hepatitis A, meningococcal, and those that contain tetanus (like Diptheria-Tetanus-acellular Pertussis or DTaP). A panel of medical experts reviewed a mountain of evidence, including both studies of whole populations and case reports of adverse events related to vaccines reported by individuals. After reviewing a number of large, rigorous studies, the committee determined that the evidence does not support a causal relationship between the MMR vaccine and autism. Although there were not enough studies to accept or reject a link between autism and the DTaP vaccine, experts did say that they were “not finding a strong signal" that there was any link. For a list of all of the findings of the IOM report, please see the link provided below. Please note that there the committee’s findings are presented in a variety of ways, including a 2-page Research Brief that provides a short summary of the committee’s review process and general findings and the full report, which includes extremely detailed information about the studies included in the evaluation. According to this report, in general, few adverse effects were caused by the 8 common childhood vaccines, though there were some adverse events linked to some of the vaccines. We encourage all of our readers to take a look at the findings of this report. The protection that vaccines provide significantly improves the quality of life in our communities. We hope this post and the links to the full IOM report we provided will help you make an informed decision about vaccinating your children. The majority of readers who reported visiting because of professional interest have a personal interest as well! Lactation Consultants make up the biggest portion of professional readers, followed by nurses, child care providers, and WIC employees. Our stats show us that we've had more than 7000 visitors in the last month! We'd like to welcome our new readers and thank those of you who return week after week to learn about Baby Behavior. For those of you who haven't answered the poll yet, we'll be accepting answers until August 31st (click here to access the poll). Knowing more about our readers helps us choose topics that we think will be of highest interest and we are always open to suggestions! If you have a topic you'd like covered or a question you'd like us to answer, send us a comment! Reader Poll: We want to know more about our readers! We know that our readers are interested in babies, but we like to know more about who visits our site for information about Baby Behavior. It has been more than a year since we did a reader poll, so we thought this was a great time to ask you a little about yourself! Please answer the questions below and, as always, send us your Baby Behavior questions in a comment or by email! *Update: This is our first time using this poll feature and we are still learning how it works. To submit your answers, you must choose an answer for each question, so if the question doesn't apply to you, just select other. Thank you! Last week, we started a series about sensory development with a post about hearing. Today, in the second part of the series, we will cover another of the 5 senses, taste! In the medical dictionary, taste is defined as “the sense of perceiving different flavors in soluble substances that contact the tongue and trigger nerve impulses to special taste centers in the brain.” What does that mean to all of us non-doctors? It means that taste is basically a chemical reaction; when food (the soluble substance) hits our tongue, the chemicals in the food stimulate our taste buds, sending a message to our brain telling us if the food contains salty, sweet, sour, bitter, or umami compounds. Flavor, however, describes the perception about what is being consumed; it is the combination of 3 senses, what is tasted on the tongue, what is smelled with the nose, and the physical feeling of the food in the mouth (more on smell and touch in future posts). So, when we say something is “spicy” or “tastes like chicken” we are actually referring to flavor. Some preferences are hard-wired into our brains. For example, babies are born with a preference for sweet and an aversion to bitter. (Beauchamp 2011; Schwartz 2009) Evolutionarily, this makes sense because foods that are sweet tend to by high in calories and bitter foods are often poisonous. Can you Teach Good Taste? Although there is more to learn about exactly how our bodies sense tastes and flavors, using what is currently known, we have some suggestions to help parents promote a varied diet for their babies! • Start when you are pregnant - Eating a varied diet while pregnant is good for you and will expose your unborn baby to all the flavors you love! • Breastfeed – Continuing to provide a variety of flavors to your baby through your breast milk can increase acceptance of solid foods when your baby is old enough. • Lead by example – If your baby sees you eating healthy foods, she’ll learn from you! • Think outside the jar - Babies don’t need to be limited to rice cereal and applesauce. 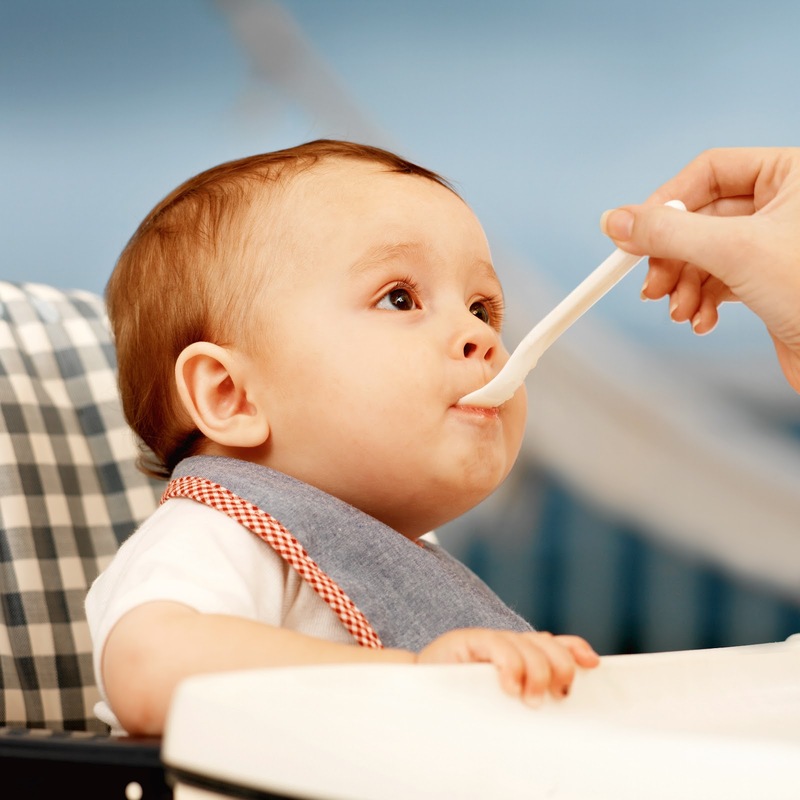 Although you should wait a few days before introducing a new food (to identify an allergy), babies can eat almost anything if it is prepared in accordance with their chewing and swallowing abilities. • Be patient – Remember, babies’ preferences change over time. Also, studies have shown that it can take 10 to 15 times for a baby to learn to like a new food, don’t give up. Beauchamp G, Mennella J. Flavor Perception in Human Infants: Development and Functional Significance. Digestion (2011) 83(suppl 1):1-6. Schwartz et al. Developmental changes in the acceptance of the five basic tastes in the first year of life. British Journal of Nutrition (2009) 102:1375-1385. It turns out that this “secret” was the topic of the next article in the series, titled "Medicating your kids for peace and quiet: Is it ever ok?" In this article, the authors provide quotes from moms who describe using medications like Benadryl and Tylenol on a regular basis and commentary from NBC’s Chief medical editor, who seems to downplay the practice and the risks associated with it. Although she mentions the risks of overdosing or experiencing unexpected reactions, she also states that “every doctor she knows who’s a parent has tried this trick at some point.” The practice of using medications to “improve” sleep in young children is not new to us; we’ve posted on this very practice in the past (click here). In our previous post, we described several research studies about the use of antihistamines as sleep aides, but until now we haven’t seen it discussed so casually. 1. We completely understand what it is like to be a desperate parent who will do almost anything for a good night’s sleep. Having young children is a full-time, physically- and mentally-demanding job. I can honestly admit that it is the hardest job I’ve ever had. 2. Just because a medication is available over the counter, that doesn’t mean it is safe for everyone, nor should it be used for reasons other than intended. Children’s Benadryl is an allergy medication, not a sleep aide; the box clearly states “Do not use to make a child sleepy” and that it shouldn’t be given to children under 4 and only to 4-6 year olds with a doctor’s instructions. 3. We have not seen the actual survey used to collect these data. This is important to mention because the structure, wording, and order of survey questions can have a huge impact on the survey results. How did we get to the point where we drug our children to get them to sleep? What can we do to prevent this from happening? This is a much harder question to answer. As a society, we need to change the belief that medicating children to sleep is acceptable and, in my opinion, that starts with doctors. If, as the physician interviewed for the article says, doctors condone this technique, that is the first thing that needs to change. Parents trust their doctors’ advice and by recommending that parents deal with their stress in this way, they are not only putting the child’s health at risk, but they are also harming the relationship between parents and their children. As we described in our original post, only one study has tested the safety of these medications in infants and another study suggested that over 50% of pediatricians have recommended them as solutions to sleep “problems.” Instead, parents should be educated about what to expect, how babies’ sleep patterns change over time, and why babies sleep the way they do. Parents need to be given tools to deal with the stress of parenting and support for when they feel overwhelmed. If you are a parent of newborn, reach out to friends and family and let them know you need some help with the chores or other children while you get a little rest. If you are a parent of an older child, call a friend with a newborn and offer to take the kids to the park or to fold the laundry. When we started this blog 2 years ago, we started our welcome message saying “It's time to use a little common sense and readjust our thinking” (see the message on the left side of the screen, under the baby picture) and it still applies today. The purpose of this blog is to provide research-based information combined with real-world experience to help parents understand their babies. Over the next few weeks, we will be summarizing our past sleep posts to help our readers find the information they need. If you are a new parent, please look through our past posts and if you don’t find the answers to your questions, send us a comment. We’ll do our best to answer your question quickly. Imagine what it must have been like during those first moments when your baby came into the world blinking against the light, his muscles tensing as a flood of new sensations washed over him. Suddenly, he was hearing the sounds of excited voices, seeing the contours of your face, feeling your fingers stroke his back, smelling the air around him, and tasting your salty skin as he nuzzled in as close to you as he could. Because babies can’t use words to communicate with us, many parents wonder how well babies can use and learn from their senses. In this new series, we’ll share what we’ve learned about the amazing process of sensory development in babies. We’ll start with your baby’s sense of hearing. The physical structures needed for hearing (babies' ears and all the structures inside) develop entirely before babies are born. During the third trimester, the auditory nerve is developed well enough that the babies can hear (and remember) many of the sounds they hear daily from the world outside the womb. Researchers have shown that newborns are familiar with the voices of their mothers and fathers and that they are particularly interested in hearing human voices as compared to other sounds. Brain development involved in the discrimination and isolation of sounds continues well into the baby’s first year of life. 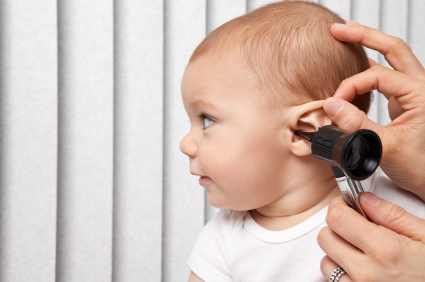 By the time they are born, babies’ sense of hearing is one of their most developed sensory systems. While newborns can hear many of the sounds around them, they may not hear the quieter ambient sounds right after birth. If you speak to your newborn while he’s alert and not distracted, he will become more focused, quieter, and slow down his movements. He may attempt to turn toward the sound of your voice but some babies take a little time to do so easily. Babies do much better in responding to sounds when they are held in a relatively upright position and calm and alert. 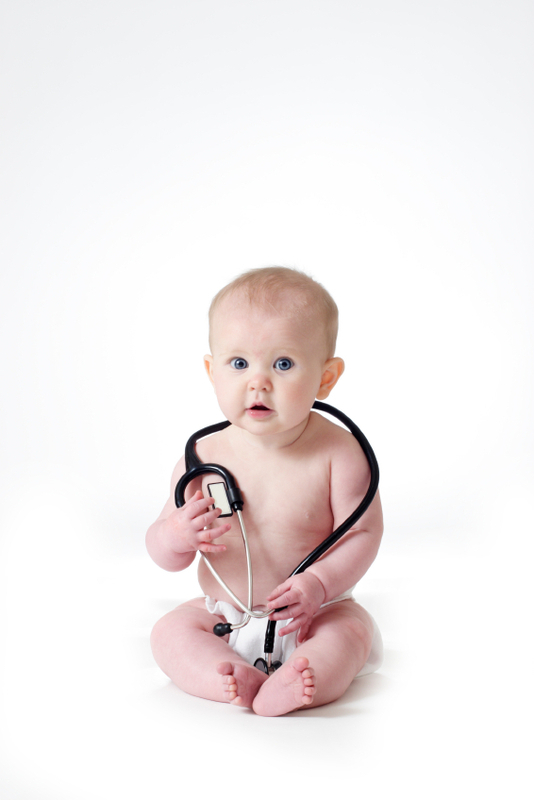 If you have any concerns about your baby's hearing, you should speak with your doctor. Mothers automatically use a higher pitched, lilting voice when speaking to their babies – this is called “Motherese” and we’ve talked about the importance of using this kind of communication in earlier posts. You’ll find that babies prefer “Motherese” when they are alert and lower softer tones when they are drowsy. Of course, dads can use their own type of "Fatherese." When dads raise the pitch of their voices and use longer tones as they speak, they will find that they can keep their infants’ attention a little longer. Researchers also have found that babies seem to prefer “happy voices” versus those that sound more neutral or negative. Both parents can match the tone and pace of their voices with babies’ readiness and interest by watching for cues. By 4 to 6 weeks of age, your baby will try to vocalize back to you, first making noises simultaneously as you speak and then by taking turns with you. By 5 months, babies have learned to identify the peculiarities of their own language and between 6 and 8 months they are able to tune out sounds that are not used in their own language. These early steps are important for babies' development of language. 1. Berger KS. The Developing Person. New York, Worth Publishers, 2003. 2. Nugent JK et. al. Understanding Newborn Behavior and Early Relationships. Baltimore, Paul H. Brookes Publishing, 2007. 3. Lester BM and Sparrow JD (Eds). Nurturing Children and Families. Malden, MA, Wiley-Blackwell, 2010. As our readers are aware, the Human Lactation Center is definitely a baby-friendly workplace. How could we not be when we do research about babies! In the past, we've provided information about deciding if bringing baby to work is right for you and tips to make it work, both focusing on the parent’s perspective. In this post, I’ll focus on the perspective of coworkers, describing my experience when Jen B brought her new baby to work. Charlotte, born last December, started coming to work with Jen B when she was about 8 weeks old and only recently stopped coming in, at about 7 months old. Here are some of the ups and downs we've shared over the past 7 months. As Baby Behavior experts who’ve conducted dozens of infant behavior trainings over the past year, we were excited to get our daily baby “fix” and enthusiastically looking forward to interacting with Charlotte and watching her cues and other behaviors. After all, my daughter just turned 4, so my personal experience spending all day with a baby was a faded memory. We learned a lot from Charlotte. Sure, she tested our patience at times, but ultimately, she reminded us why we do what we do (teach parents to understand their babies’ behavior). Babies are amazingly smart and adept at communicating their needs. Charlotte made it clear when she wanted to play or when she was tired and needed a break from all of us. She also was great at letting Jen know when she had had enough of being at the office! When she first smiled at us, she melted our hearts, and when she first rolled over at work, we were almost as excited as Jen was. Babies have this amazing drive to connect with all of their caregivers. We also realize that our workplace may be quite different than others. Some organizations are not as family-friendly, and even if your immediate coworkers have approved your bringing your baby to work, other people in neighboring cubicles or offices may not agree. Charlotte was definitely starting to get more active around 6 months and she was losing patience with being confined to her play pen (even for just a few minutes), and putting her on the ground was just not safe anymore. Trying to balance Charlotte’s needs and respect for her coworkers while getting her work done, Jen B started bringing Charlotte into the office for shorter periods, working the rest of the time at home. One day we were informed that when Charlotte cried, it was interfering with a sound-sensitive study being conducted in a neighboring office. With Charlotte’s ever increasing mobility and the possibility that she was negatively affecting others’ work, it was clear that bringing her to the office wasn’t working anymore. 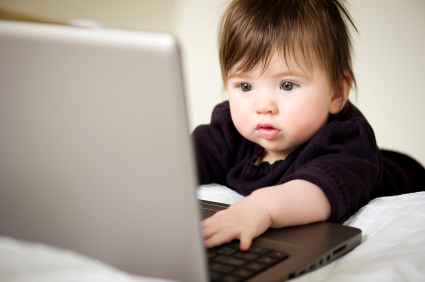 It’s true: babies can be disruptive and parents are still responsible for getting their work done. Babies use cues, including crying, to tell parents what they need, and sometimes that communication can be pretty noisy! Parents need to be sensitive to how this can affect other coworkers. Coworkers or supervisors may agree to the arrangement at first and then change their minds if they feel like productivity is affected too much. The Parenting in the Workplace Institute currently studies programs where mothers are allowed to bring their babies to work. 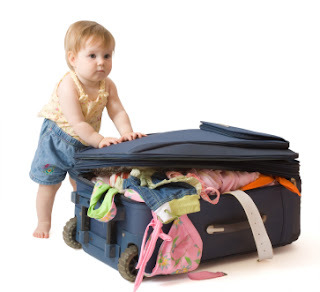 They note that, in general, babies come to work until about 6 to 8 months of age, or until they are crawling. After that, safety and liability issues grow and it’s more challenging to get work done while you chase an older, mobile baby. Realizing that you probably won’t get as much work done with your baby present, some organizations offer a reduced schedule or reduced pay while parents bring their babies to work. In the end, Charlotte taught us a lot, and she was cared for by a small group of moms who really cared about her and getting their work done. 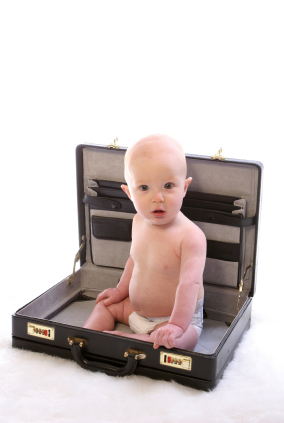 Have you been in a workplace where a baby was brought in? Share your experience with us! Last time, we described "social referencing" behavior in older infants and toddlers. Since babies can't understand all the words that their parents' say, they learn about the world around them by watching the expressions on their parents' faces and listening to the tone of their voices. When mom and dad are happy and relaxed and their voices are soft or sing-song, babies can assume that the new toy is safe and something they will enjoy. When parents' voices are sharp and their faces reflect fear or concern, babies instinctively back off. Scientists that study babies have learned that moms and dads often differ in their interactions with their babies and that these differences influence how babies see the world. In this post, we'll share research about differences in social referencing with moms and dads. BUT, we know that these generalizations don't apply to every family. Traditionally, women have taken on the bulk of the responsibilities for infant care. That means that for many generations, women have been responsible for feeding, changing, washing, protecting, and soothing their children. As a consequence, many babies and children tend to see their mothers as the "safe-haven" and as the source of daily routines and comfort. Mothers' emotional signals are powerful practical guides for day-to-day dos and don'ts. For example, a mom's strong negative emotions about an object may keep her toddler away from it even when mom leaves the room (don't count on this, though). Mothers tend to be quite protective, limiting babies' play and activity more than many dads would. This makes practical sense, especially if mothers have other children to watch. When dad is in the room, an infant or toddler will use dad as much as mom as a social reference. Dads tend to be more encouraging of wider exploration and activity than moms. When compared with playing with mom, toddlers play with dad tends to be louder and more physical. Dads tend to try to surprise their babies with new games and activities - leading to more excitement, more laughter, and more tears than when babies play with mom. This kind of play may be related to infants' development of motor skills and exploratory behavior. While looking back at his parents, a baby might see a look of concern on mom's face while dad may look excited and encouraging. Which social reference is more powerful? That would depend on the baby. With more and more dads taking on traditional care giving roles, it would be interesting to try the studies again, to see if playtime changes with dads who are providing more of the basic care for their babies and other children. Maybe some of you already know? 1. Hirshberg LM, Svejda M. When infants look to their parents: I. Infants’ social referencing of mothers compared to fathers. Child Dev 1990; 61: 1175-86. 2. Mumme D, Fernald A, Herrera C. Infants’ responses to facial and vocal emotional signals in a social referencing paradigm. Child Dev 1996; 67: 3219-37. 3. Berger KS. The Developing Person. New York, Worth Publishers, 2003. 4. Carver LJ, Vaccaro BG. 12-month-old infants allocate increased neural resources to stimuli associated with negative adult emotion. Dev Psychol. 2007 Jan;43(1):54-69. 5. Vaish A, Striano T.Is visual reference necessary? Contributions of facial versus vocal cues in 12-month-olds' social referencing behavior. Dev Sci. 2004 Jun;7(3):261-9.